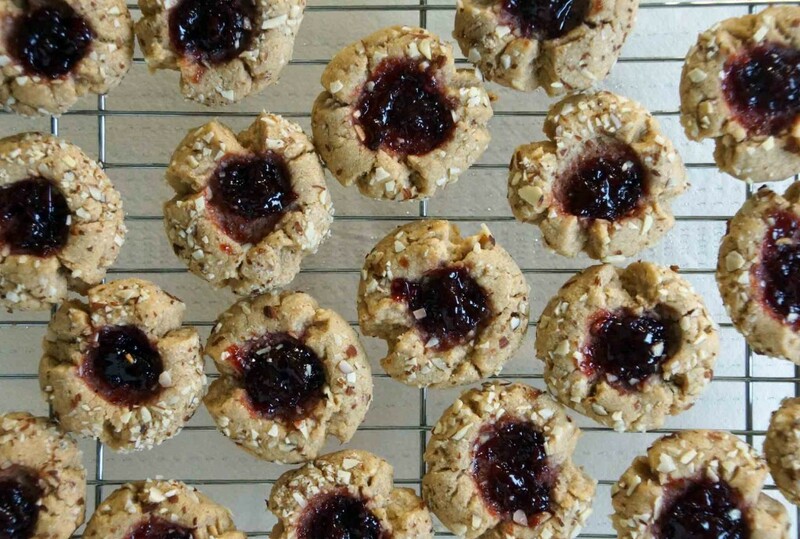 Cherry Almond Thumbprint Cookies + A Cookie Swap! A cookie swap is such a beautiful thing. You make a big batch of cookies and divvy them up, trading your single variety for a little of this, a little of that. This year, I participated in a different sort of cookie exchange. Instead of partnering up with friends or co-workers, I signed up to swap cookies with total strangers…other food bloggers! 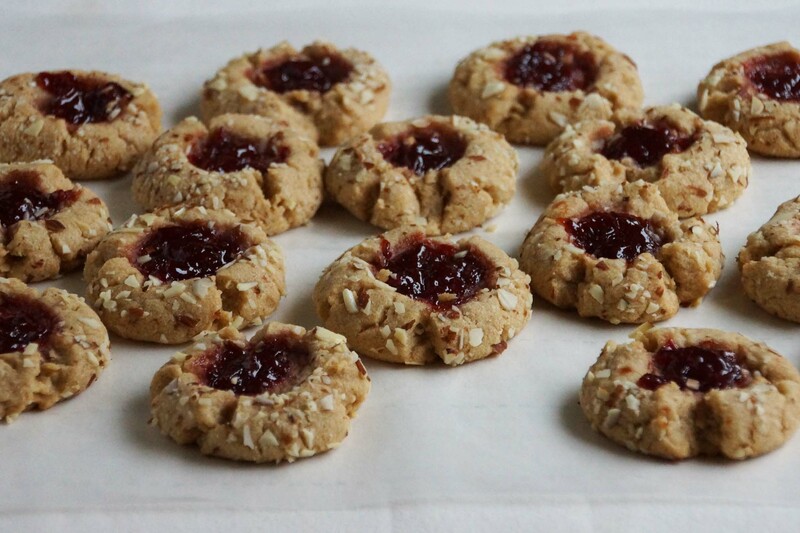 I sent off boxes of almond thumbprint cookies filled with homemade sour cherry preserves to Deb, Lynn, and Katie and, in return, received packages from 3 other bloggers. 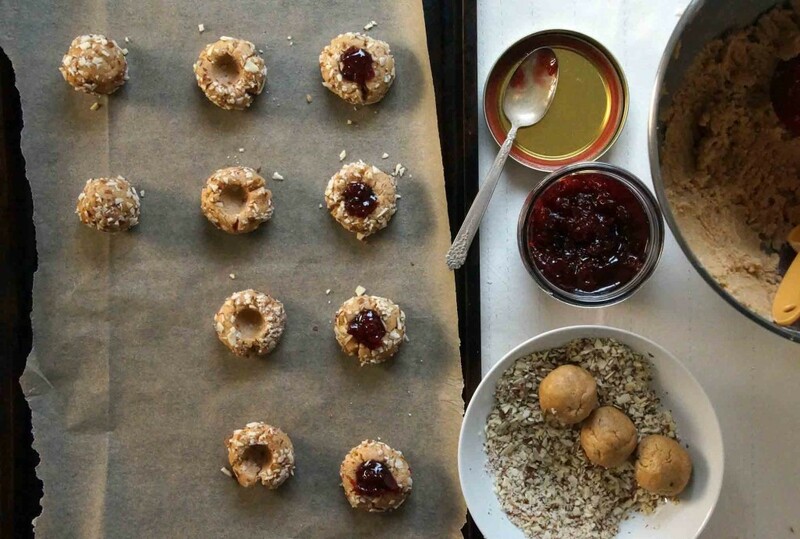 I’ll walk you through my recipe for almond butter and jam filled thumbprints, then show you the loot I received in exchange. 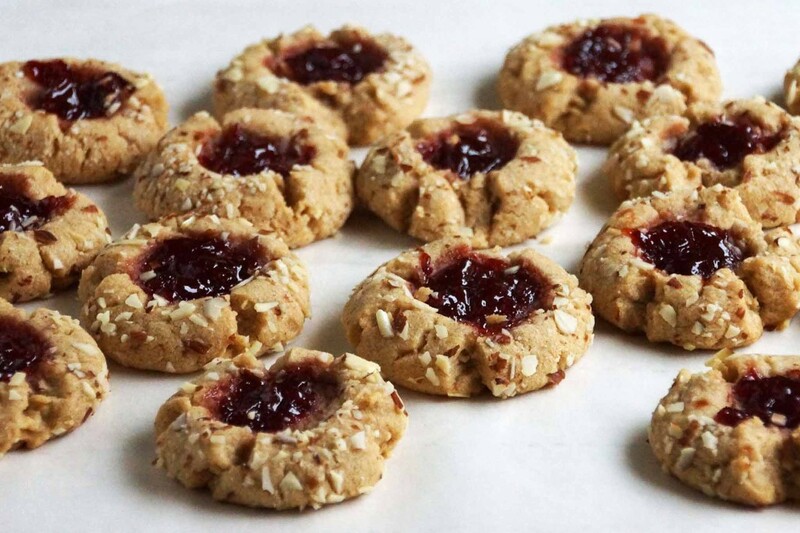 Holiday baking is never complete without jam-flled cookies–let’s make a batch of thumbprints! Soften a stick of butter, chop some almonds. 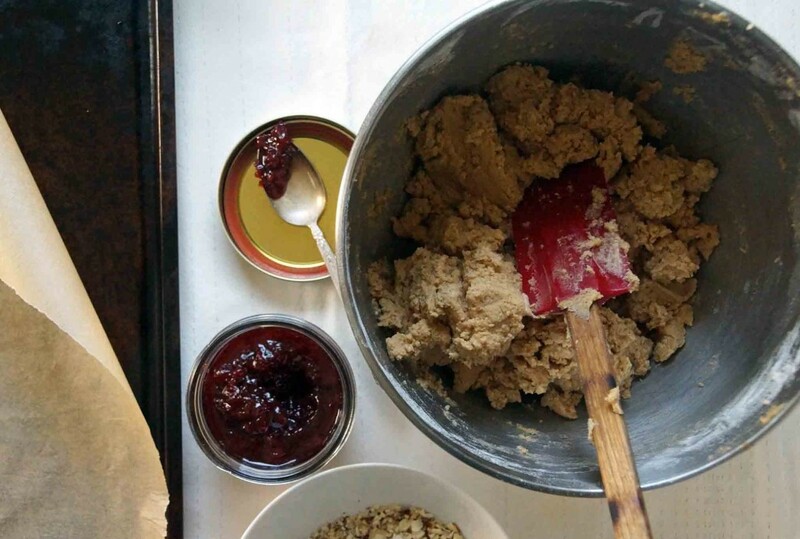 Grab the flour, sugar, almond butter, and jam and we’re off. Cream the almond butter with the, um, “cow” butter and sugar. Add an egg and a splash of almond extract; mix. 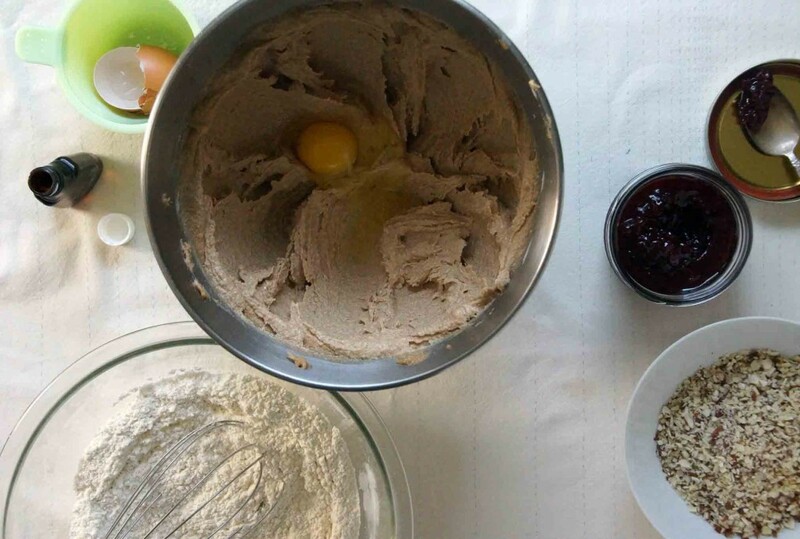 Whisk together flour, baking powder, and salt; stir it into the creamed butters until the dough forms. Form balls of dough, then roll them around in ground almonds. Set dough balls on a cookie sheet and make a dimple in the top of each one. Fill each indentation with jam. I used homemade sour cherry preserves but any good quality jam will do the trick. Raspberry? Sure. Apricot? I do love apricot with almond. Fig? Now, you’re talking. Nutella? This is just getting dangerous! Bake and cool. Wrap ’em up and send them off, if you must. After performing a little quality-control, of course. I love the combination of sour cherry and almond, but raspberry or fig jam would be equally good. In a medium bowl, whisk together flour, baking powder, and salt. 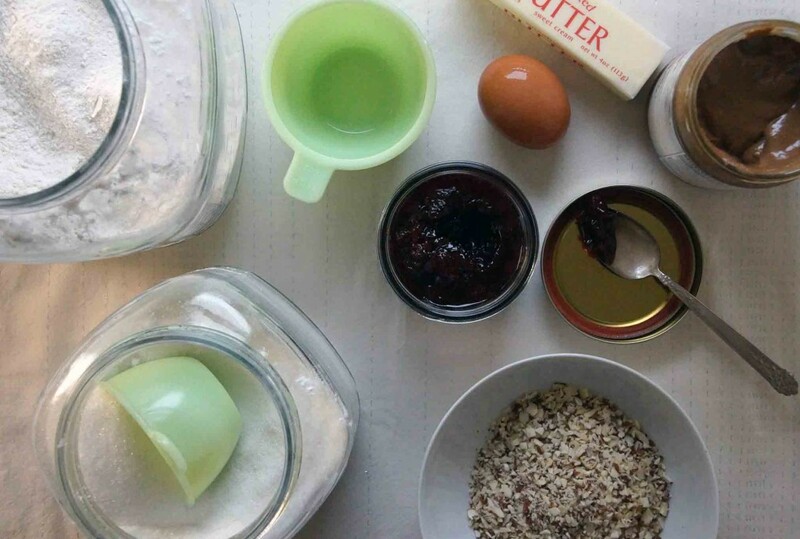 In the bowl of an electric mixer, cream the butters and sugar until light, 1-2 minutes. Add the egg and almond extract, scrape down the sides, and beat until incorporated. Add the flour mixture and mix on low until just incorporated. Form 1-inch balls of dough (about 1 Tbsp.) and roll in the chopped almonds. Place dough balls on baking sheets and make an indentation using your thumb or the back of a small spoon. Fill each indentation with about ½ tsp. of cherry preserves. Bake the cookies, rotating the pan halfway through, until lightly golden, about 14 minutes. Allow to cool for 5 minutes on the baking sheet, then transfer to a wire rack and cool completely. 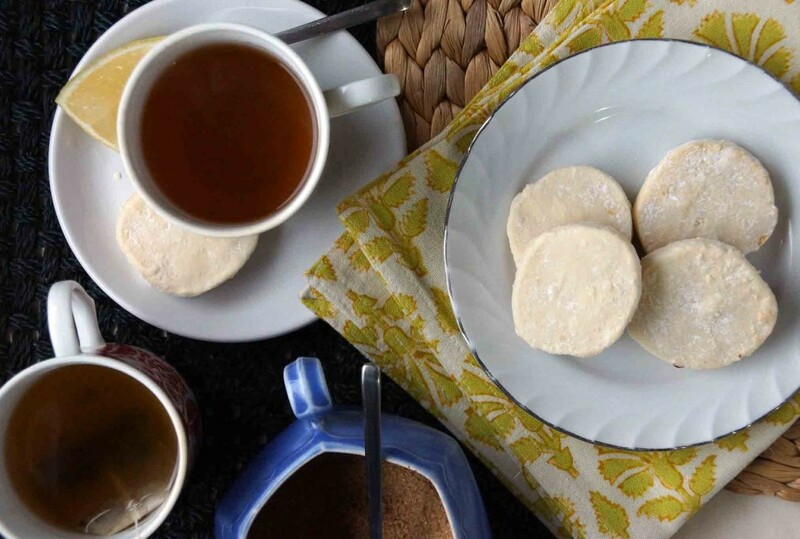 Lemon Shortbread Cookies from “Baking Bandit“. These were so good with a cup of tea. Thanks, Stacy! 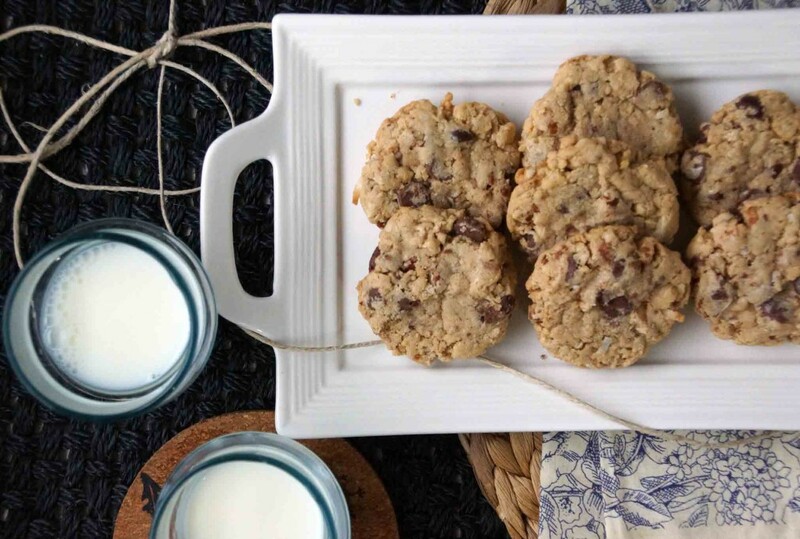 Oatmeal Chocolate Toffee Cookies from “A Handful of Everything“. 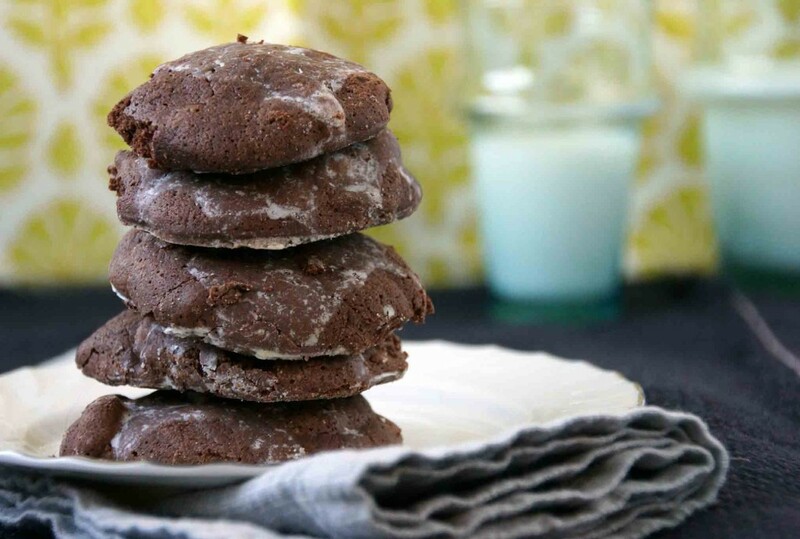 Matt can’t wait to get his hands on the recipe for these and is already dreaming up a hot fudge sundae with these cookies crunched over up the top. Krista, you may have created a monster! Chocolate Rum Chocolate Chip Cookies. You know any cookie that has the word chocolate twice in its name is bound to be dangerous. And delicious! Thanks, Jennifer! They’re long gone, but maybe I’ll bake another batch before Christmas Eve! 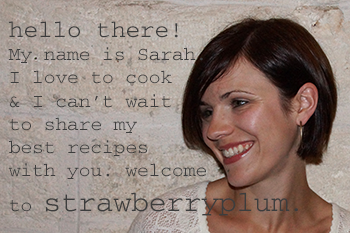 And yours are always good…how do you think I started liking jam thumbprints in the first place?? 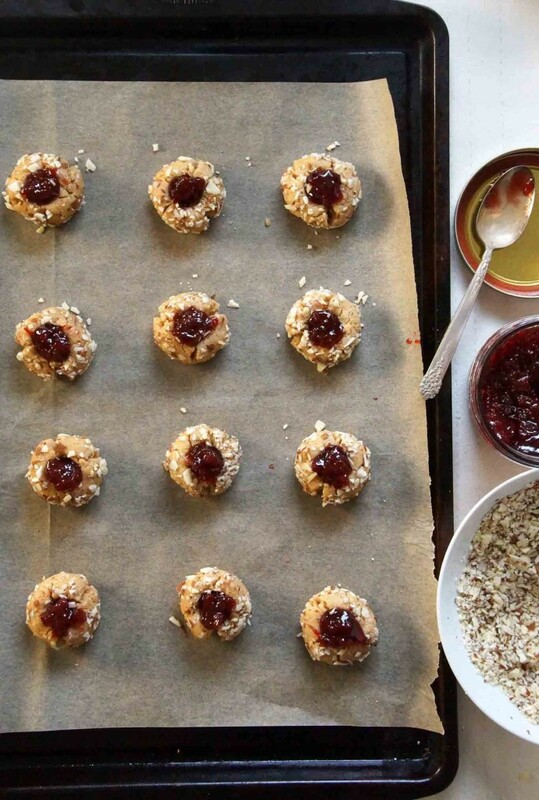 I can’t wait to make your thumbprint cookies! I was wondering where I can get the recipe for the chocolate rum chocolate chip cookies? They look delicious and have awoken the chocolate monster in me. ME WANT !! I don’t think the recipe has been posted yet, but you should be able to find it on http://www.orlandoflconnections.com soon. Hi Lynn, so glad you liked the cookies. Have a very happy holiday season! Hi Aunt Margaret, I’ve never made my own almond butter so I’m afraid I can’t be much help! I just buy it in a jar, but have noticed that my grocery store now has a “grind your own almond butter” option in the bulk department. Thanks! If I try it, I’ll let you know how it goes. I did it! I made the almond butter. I used about 2 cups of almonds and it made a little over 1cup of butter. I’m not sure it’s worth the wear and tear on the food processor though. It ran for at least 15 minutes. The cookies are super good though. almond and cherry bring the thumbprint to another level. yum!